Conceptual rendering of a 101 Freeway Cap Park developed by AECOM. In recent years several proposals have been floated for freeway cap parks in Los Angeles with barely any traction. Until now. 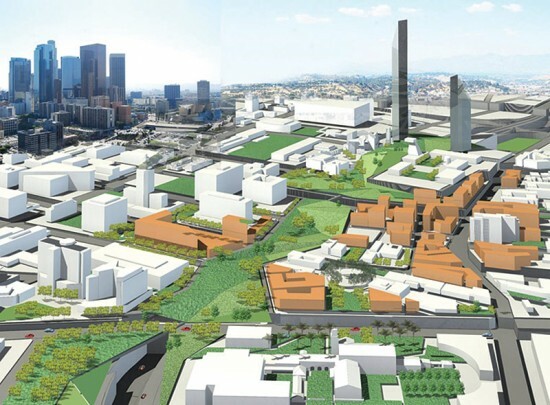 On Friday LA City Council voted to have various city departments (including planning and engineering) partner with nonprofit Friends of Park 101 to raise funds for a park that would bridge the 101 Freeway, connecting Downtown’s Civic Center with Olvera Street and Union Station. Possible grants could come from local, state, and federal sources. It’s still a long way from happening, but this is a big deal. Friends of the Hollywood Central Park have created a function on their web site where users can design their own cap park, but if Park 101 gets some of these funds we could be building a park downtown for real.